Whether you've received your gardenia plant as a gift or you treated yourself to one of these fragrant beauties, gardenia indoor care requires time and attention. Gardenias are native to China and Japan, where high humidity, bright light, and cool temperatures create the perfect growing conditions. That's not always easy inside the home, but it can be done. Many people wonder why they receive a gardenia plant full of blooms and buds and within weeks, the plant drops its flowers, loses it buds, and starts to die. The answer lies in the conditions in which you're growing the gardenia. Whether you grow your gardenia plant indoors or outside, they all need bright, indirect light. Inside the home, this means near a sunny window but not necessarily sitting on the windowsill itself. A southern-facing room is ideal, with the plant placed somewhere inside the room but not sitting under the burning rays of the sun all day. Most indoor plant lights provide the right amount of light but you may need to experiment with how close the gardenia remains to the light source, moving it closer or further away as need be. During the spring, summer and early fall, a southern window may provide all the light your gardenia needs. In the winter months, many gardenia lovers supplement the natural light in their homes with artificial plant lights to keep their gardenias happy. The lower angle of the sun and shorter days makes even southern-facing natural light limited for the gardenia, and adding another light source helps provide the bright conditions the plant needs to remain healthy. The hardest part of gardenia indoor care is keeping the humidity high enough, especially in the wintertime. Those who live in homes with hot air heating know the awful drying effects such a heating system has on the skin and hair of people. On plants, it's even worse. You can buy a hygrometer or a combination thermometer and hygrometer and keep it by your indoor plants to measure the relative humidity and adjust it accordingly. Hygrometers measure humidity, while thermometers measure temperature. Gardenias prefer the relative humidity around 50 to 60 percent.To increase the humidity near your plants, you have several options. First, you can purchase an inexpensive spray bottle and mist plants daily. If that seems like too much work, you can also place the plant on a dish or saucer filled with gravel or pebbles. Add water daily to the pebble tray. As the water evaporates, it will increase the humidity near the plant. A humidifier for your home can increase humidity to comfortable levels throughout the house or room by room, depending on your needs. While gardenias don't like to be saturated with water, a constant supply of moisture ensures the plant retains it blossoms and remains healthy. To tell if your gardenia needs water, stick your finger into the soil. If it feels dry, water it. If the soil is so soggy it feels squishy, you're watering it too much. Speaking of soil, your gardenia will need rich, well drained soil. Try an organic potting soil for the healthiest plants. The soil needs to be a bit acidic for best results. Get a soil tester kit and check it. The best soil for gardenias should have a pH between 5 and 6.If the soil is lacking in acidity, there are a few things you can do. Some gardeners swear by adding pickle juice to their gardenia soil. Vinegar may work just as well, just be sure it is diluted in water because vinegar can kill plants and is often used as a natural herbicide to get rid of weeds. Dilute at a ratio of one cup vinegar or pickle juice to one gallon of water and use it to water your gardenias once a month. You can also use a product called Miracid to keep the soil at the right acidity for your acid-loving houseplants. One thing to keep in mind if you have just purchased your gardenia is that is is probably in the correct soil already. It isn't a good idea to repot a new gardenia because it will probably go into shock and drop all its buds. Gardenias do best if they are slightly root-bound so there is really no need to repot it unless you see roots coming out of the top of the plant. If you don't like the pot it is in, just place it inside a slightly larger, decorative pot. Indoor gardenias need the same or similar fertilizer as their outdoor cousins. Use a fertilizer specially formulated for gardenias. Any fertilizer used for plants that like acidic soil also works well. Use fertilizer according to the label directions. Deadhead or remove spent blossoms. Don't be afraid to prune your gardenia as necessary. Pruning encourages healthy new growth and blossoms. For most gardenia varieties, pruning should be done right after the plant is done blooming. If you wait too long to prune, it will not bloom the next year. Don't give up on gardenias if your first plants fail to thrive or die. Gardenias can be tricky. For some people, growing the perfect gardenia becomes an all-consuming passion. The quest for the perfect scented creamy-white blossom makes growing gardenias a rewarding hobby for the amateur horticulturist. 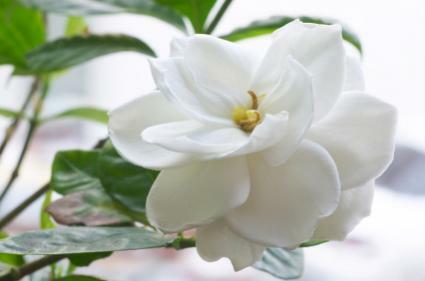 For more information on growing gardenias, please see Purdue University's fact sheet.